OSU golfer Vincent Johnson won the PGA Minority Collegiate Golf Championship &mdash; and successfully battled Graves’ disease&mdash; this past year. 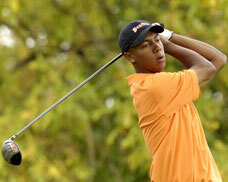 OSU junior Vincent Johnson was excited when he qualified for the 2007 PGA Minority Collegiate Golf Championship this past May. He represented himself and the university very well. The tournament had its largest field ever, featuring 180 golfers from 38 different colleges. Johnson took on that field for 54 holes at the PGA Golf Club in Port St. Lucie, Fla., and he came away with the victory — by a whopping 12 strokes. A business major from Portland, Johnson hit every green on the front nine of the last round in regulation, finishing with five birdies and only one bogey on his way to a 4-under-par 68 that gave him a 210 for the tournament. While 2006-07 ended well, it didn’t get off to a very good start. He missed most of the fall season while dealing with Graves’ disease, a type of autoimmune disease that causes over-activity of the thyroid gland, but he has since made nearly a full recovery. He was able to compete in all of OSU’s spring tournaments, shooting an average of less than 73 per round, ranking him fifth on OSU’s single-season stroke average list. Johnson, who enjoys playing the piano and video games during his free time, is an excellent student as well as an outstanding golfer. He recognizes that he has a chance to become a professional golfer, but that’s not his primary focus right now. Posted in Business, Students and Campus Life. When Keith Frost couldn’t find the quality of barbecue sauce he wanted, he decided to try his own hand at it. 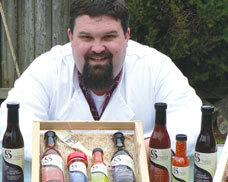 Keith Frost, a consummate griller, was frustrated with run-of-the-mill barbeque sauces. Mere “spiced-up versions of ketchup” he complains. So began his quest for the quintessential sauce. The backyard hobby soon became an obsession. Using fresh Oregon produce — sweet onions from Hermiston, garlic from Klamath Falls, plums from the Willamette Valley — the Rogue Valley native was soon serving up platters of ribs glazed with his Sweet Honey & Garlic BBQ Sauce, salmon marinated in Plum-Ginger Teriyaki Sauce, and T-bones garnished with Not-So-Hot Garlic Pepper Sauce. Once he enrolled in OSU’s Austin Entrepreneurship Program, Frost gained the business skills to parlay his culinary discoveries into a start-up. The Southern Oregon Sauce & Spice Co. got a big boost when it won seed funds from the Portland OSU Business Roundtable in 2005. Like any talented entrepreneur, Frost is constantly pushing the envelope — expanding the customer base, growing the product line, envisioning the possible. A sugar-free line of sauces is one concept under development. New spices, too, are being rolled out. “Now we’re looking for an angel investor to help us grow through this next phase,” Frost says. His goal? To sell 10,000 bottles of sauce before 2010. You may not know Mike Rich by name, but chances are you’ve seen his work. 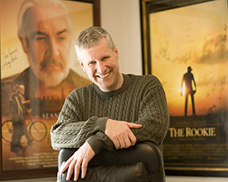 Mike Rich wrote the script for "Finding Forrester" and "The Rookie"
Mike Rich was working as a news reporter at a Portland radio station in the mid-1990s when he decided to turn his dream of writing a screenplay into reality. Setting aside a couple of free hours each day, he wrote “Finding Forrester,” a story that delves into the relationship between an inner-city teen and a reclusive writer. After unproductive attempts to contact agents, production companies and studios, Rich entered the play in the Nicholl Fellowship competition sponsored by the Academy of Motion Picture Arts and Sciences. After that, interest developed quickly. Columbia purchased the script and Sean Connery agreed to play Forrester. At that point, Rich “thought they would just go off and make the movie.” He was wrong. Six rewrites later, it was shot. Over the past eight years, the OSU College of Business alumnus has followed “Finding Forester” with “The Rookie,” “Radio” and “Miracle,” all successful movies. “I always start with character. The audience needs to care about the people,” Rich says. Look for more from Rich. “Manhunt,” an adaptation of a historical thriller about the search for John Wilkes Booth, is being filmed; “Invincible,” the story of Philadelphia Eagles fan Vince Papale, a bartender who tried out for the team as a kicker and made it, is set for release later this year; and “Nativity,” a story leading up to the birth of Jesus of Nazareth, has been purchased by New Line Cinema. Posted in Business, OSU People and Programs, The Arts. Through OSU’s Austin Entrepreneurship Program, Dylan Boye and Blake Heiss are making their business dream come true. Dylan Boye and Blake Heiss want to be filmmakers, and they’re finding OSU an ideal place to develop that dream. The juniors from Brookings, Oregon, both photography majors, have been friends since 5th grade and, because of their similar goals, went into business together in the 7th grade. At first, most of the business was transferring old movies to DVDs. “It originally was an excuse to make money and get camera equipment to work with,” Blake says. Both came to OSU, but during their first year they lived in separate residence halls, and the business languished. This past year, however, the Austin Entrepreneurship Program residential program in Weatherford Hall was opened, and they moved in together. “At Weatherford, with faculty living in and checking on how things are going, that keeps the idea going, and it really helps,” Dylan says. “Looking at how we did compared to the previous year shows how much it helped. The faculty and students in Weatherford were really helpful in getting the business back off the ground.” Now the two are doing what they want to do. And their friendship? “Having a business makes a friendship different, but we’re still good friends,” says Dylan. Posted in Business, OSU People and Programs, Places. Alan Mui and his partners, Howie Price, Brian Gin, and Chris Allen, developed an affordable web-based surveillance system. That observation by Ilene Kleinsorge, OSU’s College of Business dean, is getting its first full test with the opening this fall of the renovated Weatherford Hall as a residence hall and laboratory for students in the new Austin Entrepreneurship Program. One of the first businesses to come out of the program was established by Alan Mui, an engineering major who graduated in June before having an opportunity to live in the residence hall. Achterman and other experts say there is no shortage of problems the institute might tackle. They have already brainstormed a list of 70 to 80 potential projects, such as ways to promote business development and the state’s economy in an environmentally sensitive way or do a better job of environmental restoration without unnecessary government regulations. Posted in Business, OSU People and Programs. Students, faculty, and visiting business leaders are living and working in the renovated hall focused on entrepreneurship. The College of Business’ new Austin Entrepreneurship Program now has a home of its own with the reopening of historic Weatherford Hall in the fall of 2004. A College of Business faculty member and visiting professionals live with students in Weatherford to complement the college’s formal and informal entrepreneurial programming. Although the renovation of Weatherford wasn’t completed until fall, the first class of students in the entrepreneurship minor begins course work in winter 2004. 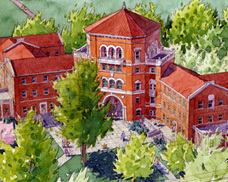 The new residential college program was spurred by a gift from OSU alumnus Ken Austin and his wife Joan. It makes OSU one of the few universities in the country where students live, eat, learn, work, and dream together in a business incubator community. In addition to rooms that accommodate 285 students, the renovated Weatherford features a cyber café, business incubator spaces, a library, seminar rooms, and apartments for visiting faculty and business leaders. The program, which is intended to stimulate economic growth and create new jobs in Oregon, is administered by the College of Business in partnership with University Housing and Dining and the College of Engineering. It is expected to attract top students from a variety of OSU colleges, including engineering, forestry, and pharmacy.